You will earn 23,006 Reward Points. Earn 1 reward point for every 1 dollar spent. Left Hand Door Hinging: Compartment Doors hinged on the left, controls on the right. Condensate Drip Trough: Provided under lower compartment door to collect condensate. NSF Certified 6˝ Stainless Steel Legs with adjustable flanged feet for a one inch level adjustment. Durable 14 Gauge, Stainless Steel Construction: For compartment door, cavity and cabinet frame. Automatic Boiler Drain: Contains a “Water Jet” Spray Rinse Drain Cleaning Cycle to keep drain clear. Instant Steam Stand By Mode: Holds generator at a steaming temperature. Allows unit to start steaming instantly. Pressureless cooking permits doors to be opened during opera- tion. Capacity for up to ten 12” x 20” x 21 ⁄2” deep Cafeteria pans, five each compartment. Exclusive Automatic Float for Water Level Control: Separate from the generator for easy access, contains a high velocity rinse cycle to eliminate mineral buildup. Two 60 Mechanical Timers with ON/OFF Main Power Switch with a Heat On, Low Water Indicator Lights and High Temperature Safety Light and Shut-off (Reset Light). Exclusive “Cool to the Touch” Two-Piece Compartment Door Design: Free floating inner door with reversible gasket provides an air tight seal. Stainless Steel Slam/Latch Door mechanism for reliability. Main Power On/Off Switch: Controls the electric power and automatically fills the generator with water. A separate Steam Switch ignites the burners via a fully automatic Electronic (pilotless) Spark Ignition. Exclusive Steam Cooking Distribution System: Exclusive Brass Steam Jets produce a high velocity convection steam without fans. Curved Corner design in cooking compartment distributes heat evenly, easy to clean. Creased top & bottom enhance drainage. 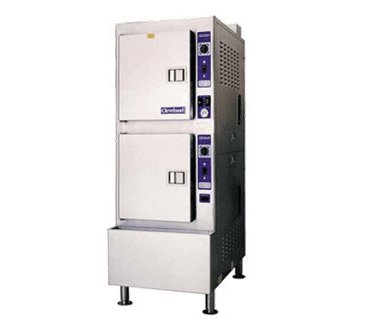 Cold Water Condenser for each compartment maintains a dry steam. Fully insulated cooking compartment for thermal efficiency. Removable Stainless Steel Slide Racks. Reversible Door Gasket. Exclusive PowerPak Gas Steam Generator: High Efficiency Forced Air (Power Burner) Gas Fired Boiler has 240,000 Btu’s Input, produces 180 Ibs of steam per hour. 10-12 PSI operating generator pressure. Steam generator is equipped with a High-Limit Pressure Safety Switch, 15 psi Safety Valve and a Secondary Low Water Shut Off Safety standard. Fully insulated rear mounted steam generator. Gas Pressure Regulator and Control Valve included standard. CLEVELAND, SteamCraft® Power 10, two compartments, Floor Model Steamer, Model 24-CGP-10. Single, large capacity Gas-fired Pressure Steam Generator, 240M BTU input. Exclusive Automatic Water Level Float design. Steam Generator with Automatic Water Fill on start up, Automatic Generator Blowdown, Electronic Spark Ignition and Generator Standby for instant steam. Choice of Compartment Controls, Manual By Pass Operation Mode. Exclusive Cold Water Condenser design. Very satisfied with the new equipment.